This year marks the centennial of the Pulitzer Prizes awarding. "We're celebrating by telling stories on the prize winners, finalists and their work, and by partnering with individuals and organizations to host events across the country." 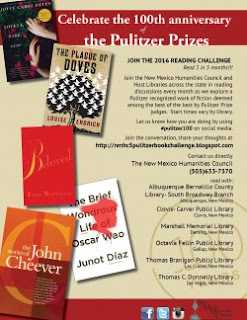 Beloved - December 17th ...and If 5 books is not enough of a challenge for you, download the Pulitzer Bookmark and read the fiction winners from the first 50 years: 1917-1966.